My name is Jack Enright and I am a May 2013 graduate of Texas Christian University (TCU) in Fort Worth, TX. I graduated with a Bachelor of Arts in political science and international economics. During my time at TCU, I wrote articles in the TCU Daily Skiff student newspaper and founded chapters of two organizations. One was Young Americans for Liberty, a libertarian student group inspired by Ron Paul that has several hundred chapters across the country. The TCU group is now known as Liberty at TCU. The other chapter I founded was Camp 14 Project, a group with a counterpart at Dalhousie University in Canada that is based off of the story of North Korean prison camp survivor Shin Dong-hyuk. After I graduated, this group became a Rescue Team for Liberty in North Korea. 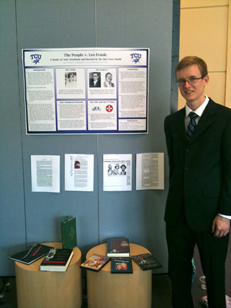 On the right, you can see a photo of me next to my research at the AddRan Festival, hosted by TCU. It is an event put on by the liberal arts department to allow students to showcase their creativity and academic research. I presented my research on the Leo Frank trial over the murder of Mary Phagan. The conviction of Frank, which many believe was motivated by anti-Semitic and anti-North prejudice of the day, coincided with the formation of the Anti-Defamation League of B’nai B’rith (ADL), an organization fighting anti-Semitism and bigotry that is still working towards this goal today. Founder Sigmund Livingston’s recognition of a need for the organization was validated by the case. It also led to the revival of the Ku Klux Klan, so I was interested in how such a relatively little-known case had such far-reaching implications. I was highly involved in Alpha Phi Omega, a co-ed service fraternity, while at TCU. I earned 99 service hours in the spring of 2011 and was the Service Vice President in the fall of that year. I enjoy the satisfaction that comes with serving others and the community, and believe in Martin Luther King’s statement that injustice anywhere is a threat to justice everywhere. My experience in the organization has shown me the ways in which those less fortunate are kept in the cycle of poverty by factors like usury (payday lending services) and lack of advancement opportunities due to a number of factors. It’s my goal to have my life’s work change this and enable them to climb the ladder they haven’t been able to find. 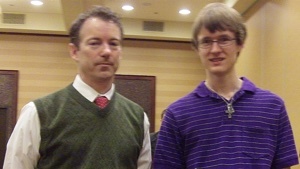 During spring break in 2010, I traveled to Kentucky to assist with the campaign of now-Senator Rand Paul, pictured with myself to the left, on behalf of Young Americans for Liberty during his primary. I went door-to-door to conduct voter ID of likely Republican voters in the Louisville area and gauge support for Paul and other local races. I also filled envelopes for National Right to Work and attended lectures from various political experts. It was a great way to learn about the campaigning process and network with like-minded individuals from across the country. Another interest of mine is technology, which has fascinated me since the days when the original Pentium processor was still king. I gained an early interest in distributed computing programs like Prime95 (searching for multi-million digit prime numbers) and Folding@Home (studying protein folding to help find a cure for cancer and other diseases). I also do web development with WordPress and the Thesis theme (both of which are used on this site) and video editing using Final Cut Studio 3. Thank you for reading about me and visiting my site. Feel free to read my writing or contact me if you have any questions or comments.